Kinderkuchen for the FBI: From the New York times. MOSCOW — Two of the world’s most important opera companies, the Metropolitan Opera in New York and the Bolshoi Theater here, will collaborate on three stagings in coming years, they announced on Monday. The productions — Verdi’s “Aida,” Strauss’s “Salome” and Wagner’s “Lohengrin” — will all star the Russian diva Anna Netrebko. Vladimir Urin, the Bolshoi’s general director, said in a news conference here that he mentioned his Met counterpart, Peter Gelb, and their negotiations at a meeting with President Vladimir V. Putin of Russia last February. Mr. Putin approved the arrangement, which will result in performances from 2019 to 2022. But Mr. Gelb said the collaboration did not constitute true cultural diplomacy since, unlike during the Cold War, Russian and American performers now work together so often. Ms. Netrebko, for example, has been one of the Met’s biggest stars for the past decade. 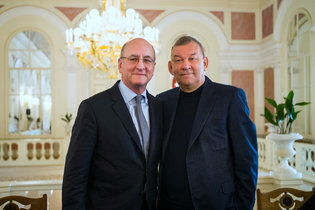 Mr. Urin said that he and Mr. Gelb were introduced by a Bolshoi adviser: John Berry, the former artistic director of the English National Opera in London, which had developed a healthy co-producing relationship with the Met. “To collaborate with this great theater has been a longtime dream,” Mr. Urin said of the Met in a statement, while Mr. Gelb spoke highly of the Bolshoi’s recently renovated technical facilities.